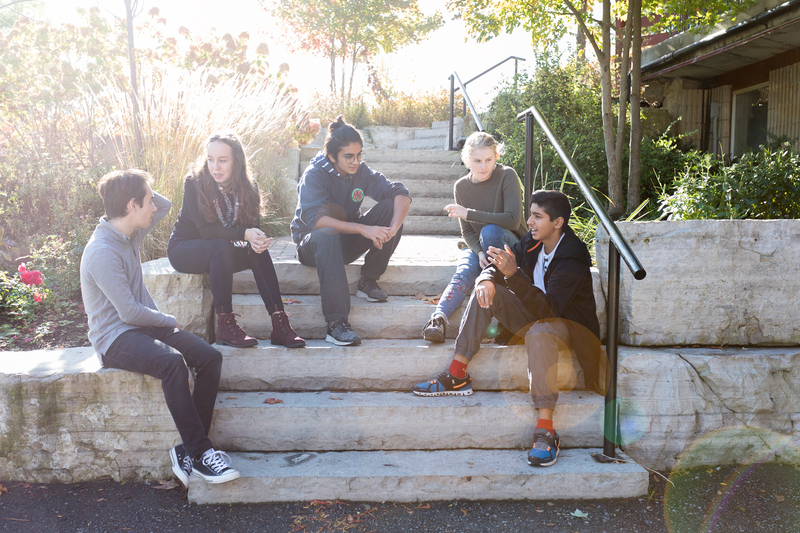 High School at Toronto Waldorf School is a wonderful blend of sciences, mathematics, arts and humanities, with a healthy dose of social life and physical activity. Our deeper perspective on education bears visible fruit in the high school years; students are actively engaged demonstrating clear thinking, awareness and expertise in a wide variety of areas. These are the years in which Waldorf education completes its contribution to each student’s foundation. It is our experience that nearly 100% of our graduates get into a university or other post-secondary program of their choice. In North America, over 94% Waldorf graduates attended post-secondary education. (View statistics here). Professors report they can identify Waldorf grads in their classes by their clear thinking and interest in both context and the reasons for phenomena. Waldorf grads see behind the facts, seeking to understand the context and dynamic; they don’t focus on just memorizing for exams. Watch a short video on two Grade 12 students presenting their 3D printer project to younger students. Two Grade 12 students were placed second and third in a poetry contest. A quiet confidence, an interest in the world and motivation to solve problems are notable traits of Waldorf grads. Their years at Waldorf have educated them for life. Watch our alumni/ae video profiles to see how Waldorf education helps them in their career and life. High School at Toronto Waldorf School offers a challenging, rigorous curriculum that includes an integration of sciences, mathematics, humanities and the arts. Academics are balanced with physical activity, work experience, wilderness trips and a healthy social life. Education from a deeper perspective™ aims to develop clear thinking, active participation and a feeling of moral responsibility. Our curriculum meets OSSD requirements as well as additional elements of education from a deeper perspective™. Our school is also accredited by the Association of Waldorf Schools of North America (AWSNA). A two hour lesson that starts each day for large academic topics such as organic chemistry, similarity and trigonometry or history of drama.Each main lesson block lasts 3-4 weeks, taught by teachers specializing in the subject and has an artistic or movement component that enhances the learning experience. 45 minute periods after Main Lesson for subjects requiring on-going practise and skills development such as French, math and sciences. For fine arts, physical education and crafts such as metalwork, woodwork or bookbinding. Offered in single or double 45 minute periods, ideally after lunch. High School Advisors support each class from Grades 9 through 12. The advising team work with students through their four years of high school, liaising with parents regularly and as needed. They contribute anecdotal information to report cards and participate in end of year trips. 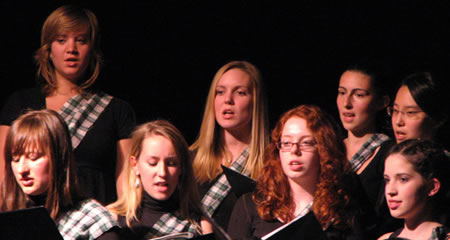 Each high school student selects two performance arts courses each year. Options include: orchestra, choral music, drama, stage technology, circus arts and eurythmy (a movement art). All students in Grades 9 to 11 participate in a work practicum each spring. Grade 9: 3 weeks overnight stay at an organic or biodynamic farm, participating in the daily rhythm and chores of the farm. Grade 10: 2 weeks working full time in a business or industrial setting. Grade 11: working full time in a social services environment such as a childcare, kindergarten or home for the disabled or aged. The High School is an entity within the larger TWS community. Students get to know others in all grades, facilitated by the High School Initiation camping trip in September each year.As well, performance arts courses include students from Grades 9 through 12, providing further opportunities to socialize with students of other grades. The High School year includes dances, the Prom, “On the Wings of the Arts” performance evening, coffee houses for student performances, fundraisers and end-of-year outdoor education trips. The competitive sports program is open to all (from Grades 7 – 12), and includes practices, local games and out of town tournaments. Sports include volleyball, basketball, badminton, and cross-country running. Toronto Waldorf School welcomes a number of International Waldorf students each year to study with us. In the past, we had students come from Waldorf schools in Austria, Brazil, China, Columnia, France, Hungary, Italy, Germany, Netherlands, Peru, South Africa, South Korea, Spain, Sweden, Switzerland, Ukraine and USA. The TWS Exchange program enables our students to travel to Europe (a French or German speaking country) to study for 4 months, and to welcome a student into their home in Canada as well. Those who choose not to do an exchange benefit from the presence of the International Waldorf students who study at TWS, resulting in friendships and cultural exposure to students from afar. These are the typical Main Lessons in each grade. Do browse our site or visit our campus to learn more. See how education from a deeper perspective™ can make a difference in students’ lives.